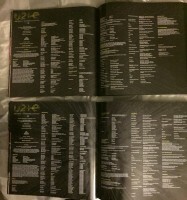 When a U2 tour starts there are no photos of the tour in action. And yet a tour book must be designed. 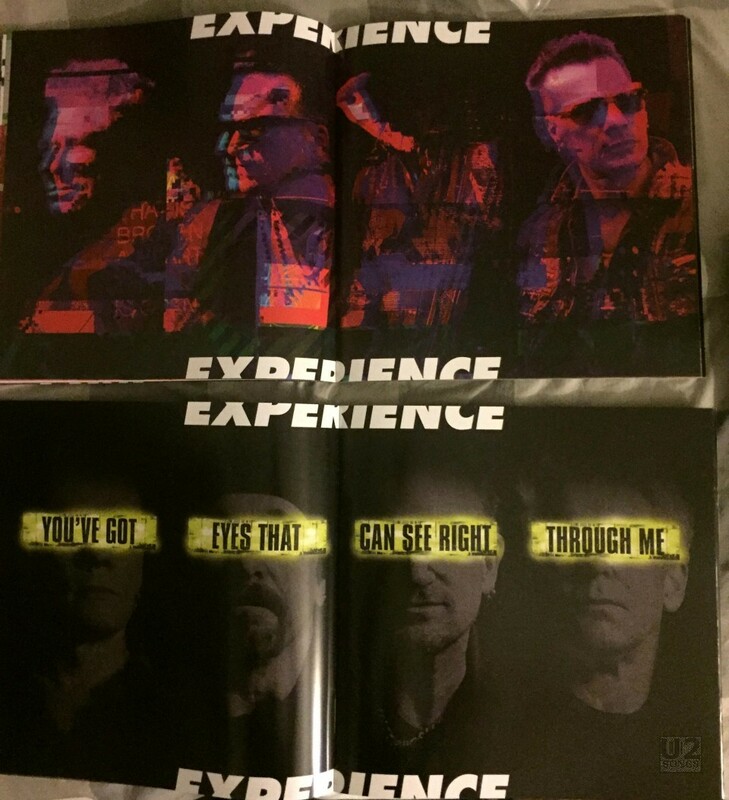 With the #U2ieTour, the tour book sold throughout North America was a book featuring a bunch of promotional photos shot before the tour started. That book also made it to Europe for the earliest shows. 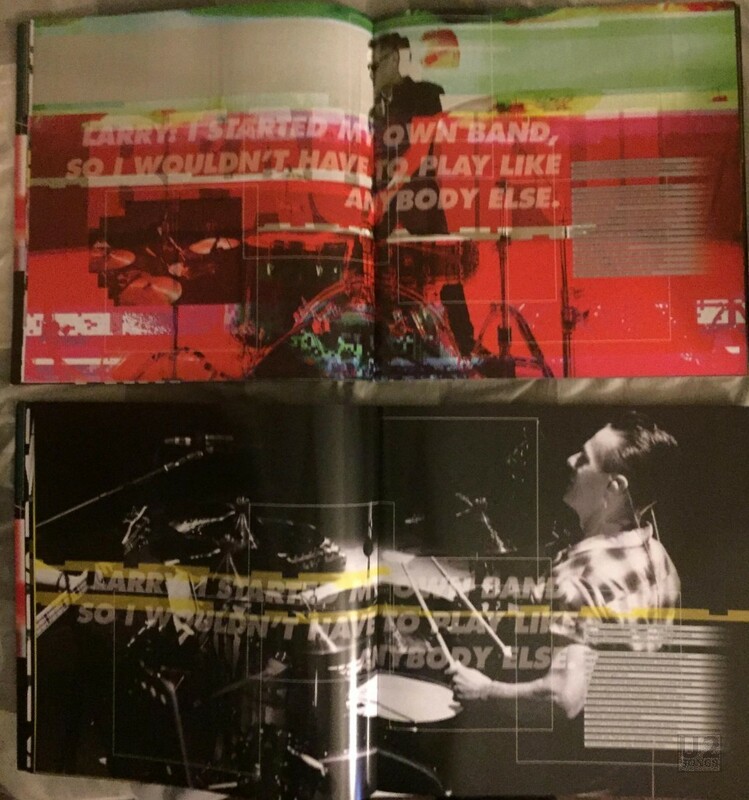 But at some point along the way a new tour book was introduced, and this book was sold at the shows later in the tour, including London, Paris and Dublin. So the question is how did they differ? 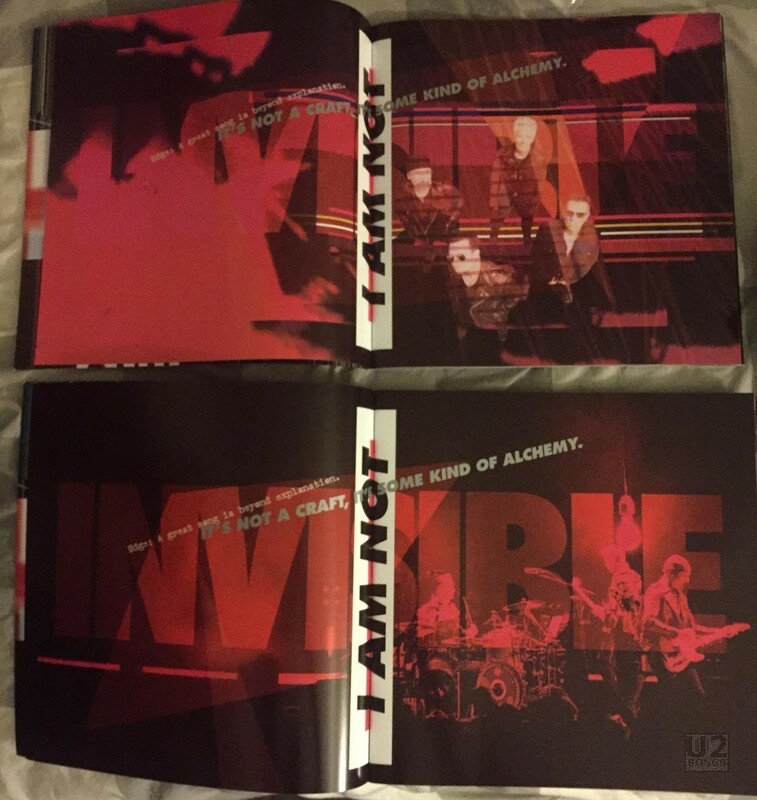 First of all, the tour book is split into two opposing sides, one titled Innocence and one titled Experience. The Innocence side for both tour books is identical. It has the same page count. It has the same photos, and it has the same text. 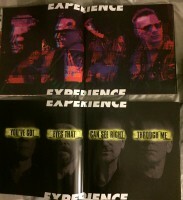 The changes in the tour book all came on the Experience side. 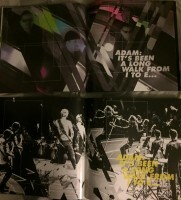 First of all there are four new double page photos which are not present in the original book. You can click on the images below for a closer look at the changes. 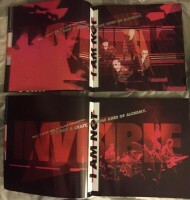 The first double spread is a photo from “Invisible” of each of the band members performing in the screen. It is titled “The Future Better Hurry Up”. 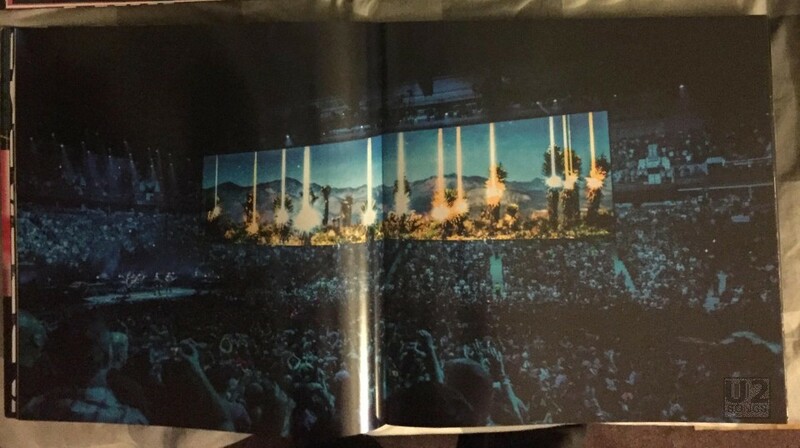 The second new double spread is a photo of what I lovingly called the laser Joshua Trees. It is a photo of the image on the cage, surrounded by the crowd lit in blue. 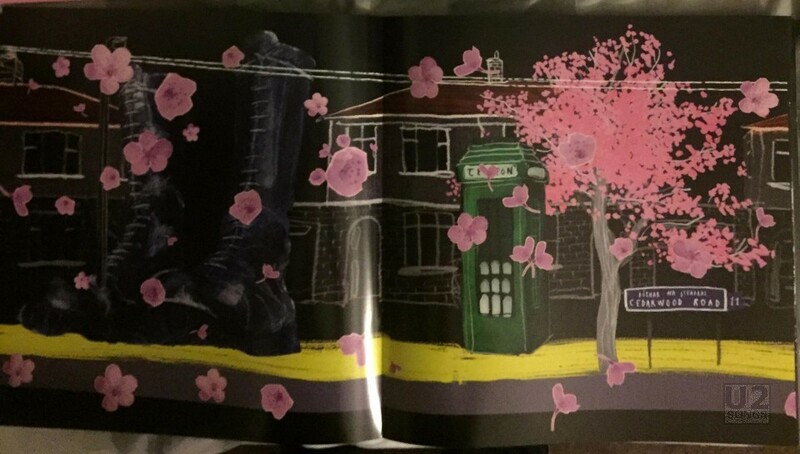 The third new double spread is a photo of the cage with the cherry blossoms from Cedarwood Road blowing across the screen. 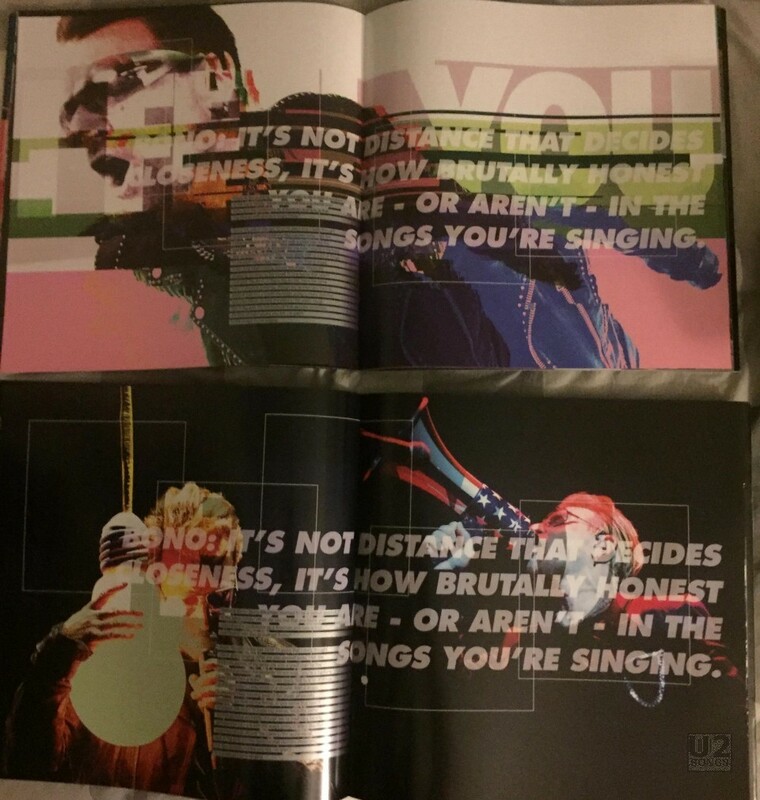 The fourth and final new spread is a photo of the Edge inside the cage, being held up by Bono’s hand as an image on the cage. 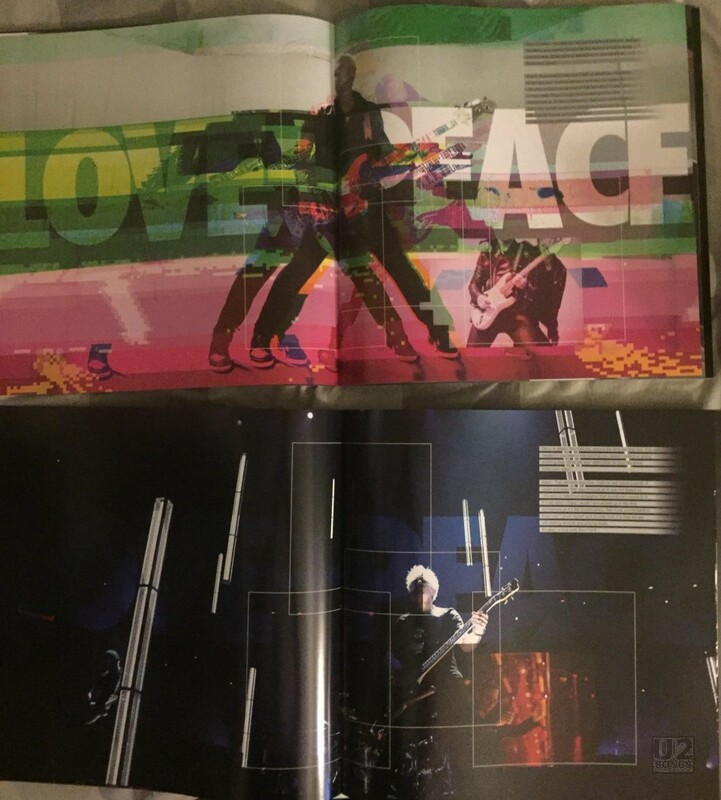 Not only are these four new double spreads included, increasing the page count by eight over the initial tour book, but a number of the promotional images used in the initial printing of the tour book have now been replaced by actual live images shot during the tour. 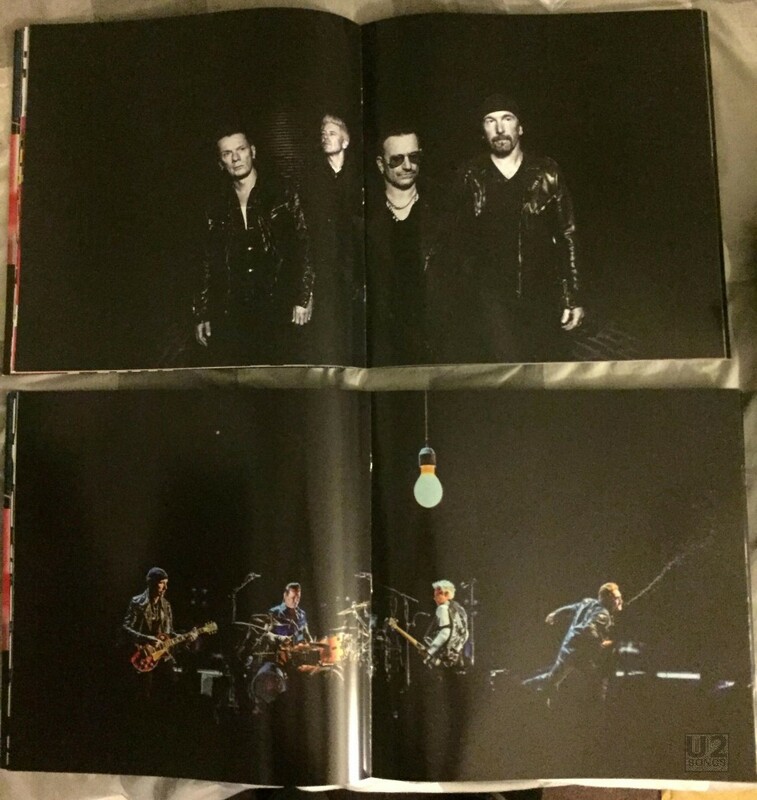 This double page spread of “Invisible” replaces the overhead promotional shot of U2 with an image of them performing on stage with the light bulb over their heads. The text remains the same but perhaps, is easier to read in this new iteration. 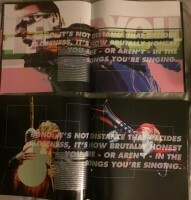 This double page spread features the lyrics of “Joey Ramone” and is inset with four photographs of the band. The initial tour book features four interesting photos of the band – especially that one of Larry throwing himself backwards arms spread. But all four have been replaced with black and white photographs from the tour. 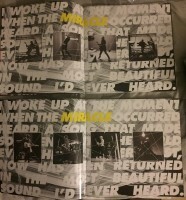 Larry’s double spread was initially in red and green, and has been replaced with black and white and a hint of yellow. The photo is now of him playing the drums during one of the tour performances as well. The text accompanying the photographs has remained the same, and is laid out the same. Only the photographic elements have changed. The “Experience” double page layout once again gets rid of the reds and blues and purples, and replaces it with the now more expected black and white and yellow. 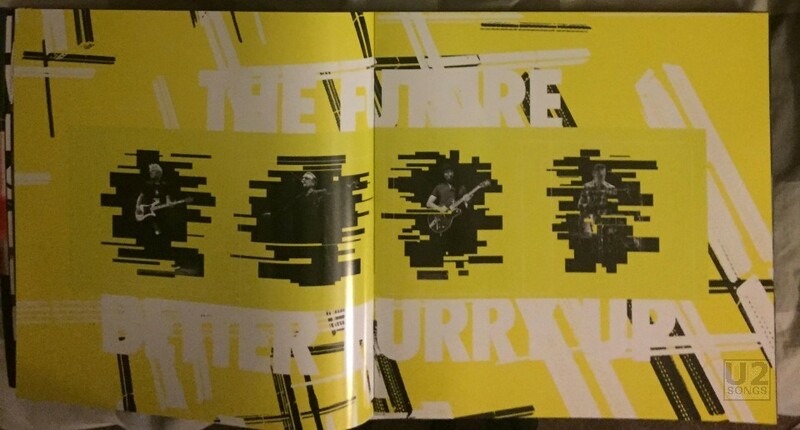 The four promotional images of the band have now been replaced by black and white head photos of the band with cut outs resembling the cage, with words in black on yellow ala the intermission using “The Fly” which read “You’ve Got Eyes That Can See Right Through Me”. The image of the band used on the interior of the album? 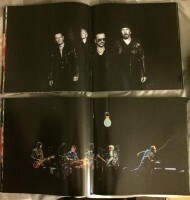 Now has been replaced by an image of all four band members on the main stage with the light bulb hanging over them while Bono sprays water into the crowd. I’m guessing this was during “Out of Control”. All of the band spreads have been updated. The greens and pinks in Bono’s original spread now give way to a couple of images of Bono on stage, one holding the light bulb close, and the other with his North American bullhorn. 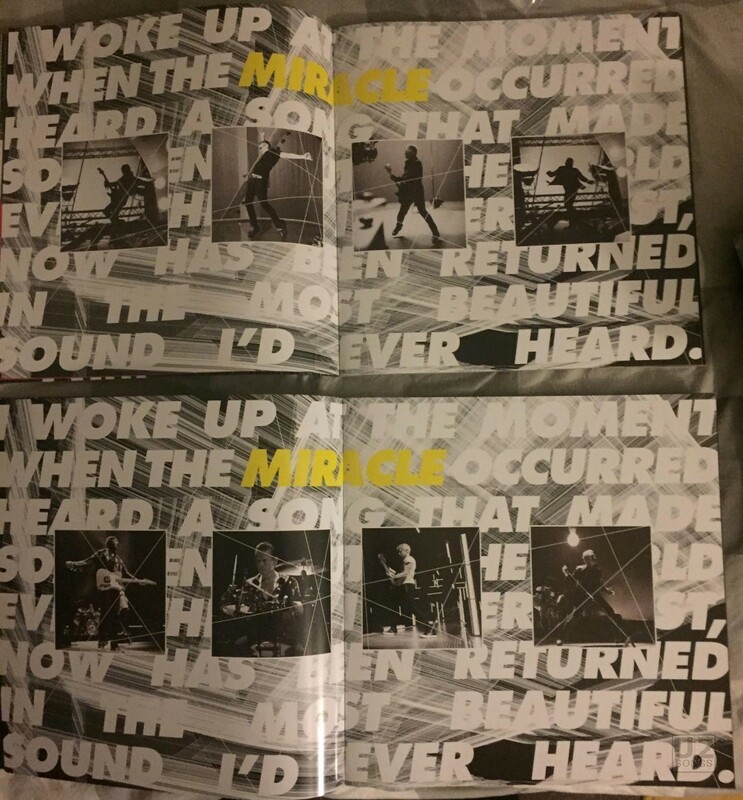 Like the Larry spread, the text remains the same and is laid out in the same locations. 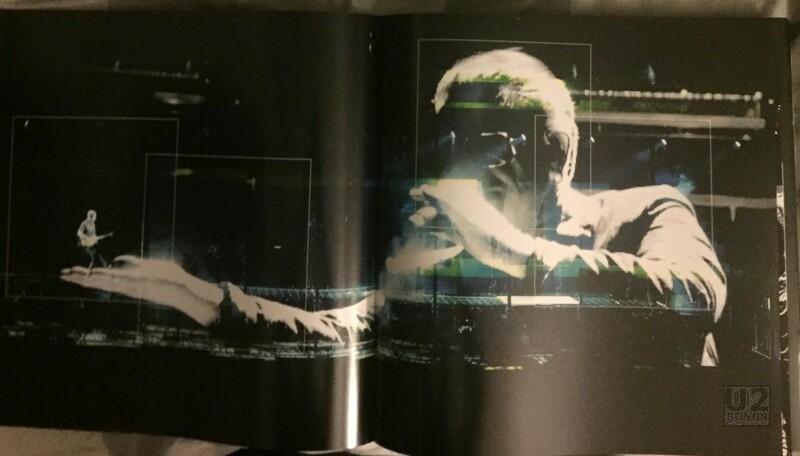 The Adam Clayton double spread again started out as a quite colourful piece with oranges, yellows and greens, and has become a much darker image. 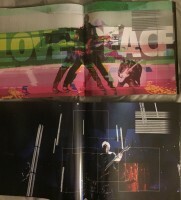 The overlay of “Love + Peace” all but fades into the background in this new double spread, but it is still there. Like the prior layouts the writing stays the same in the article itself. 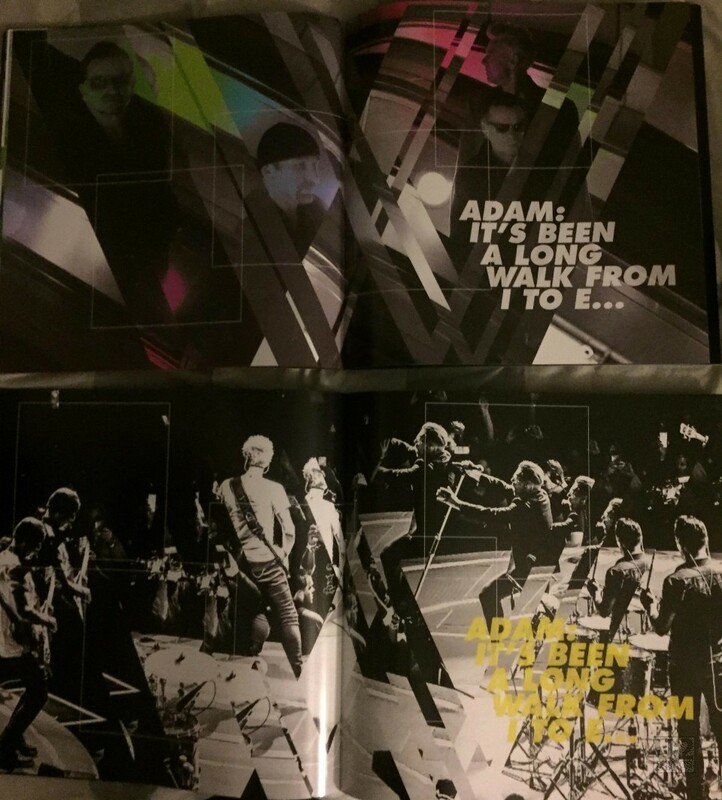 Finally, the last band layout with Adam’s quote “It’s been a long way from I to E…” has also changed, replacing the rainbow tinted band promotional shot with a cool multiple image photo treatment of the band playing in concert. Adams quote remains unchanged in both. And although it may be difficult to tell, the credits have had a bit of an update and a refresh as well. For one, they’ve gotten longer as the tour has progressed. And Dennis Sheehan’s name has been added to the dedications at the end. 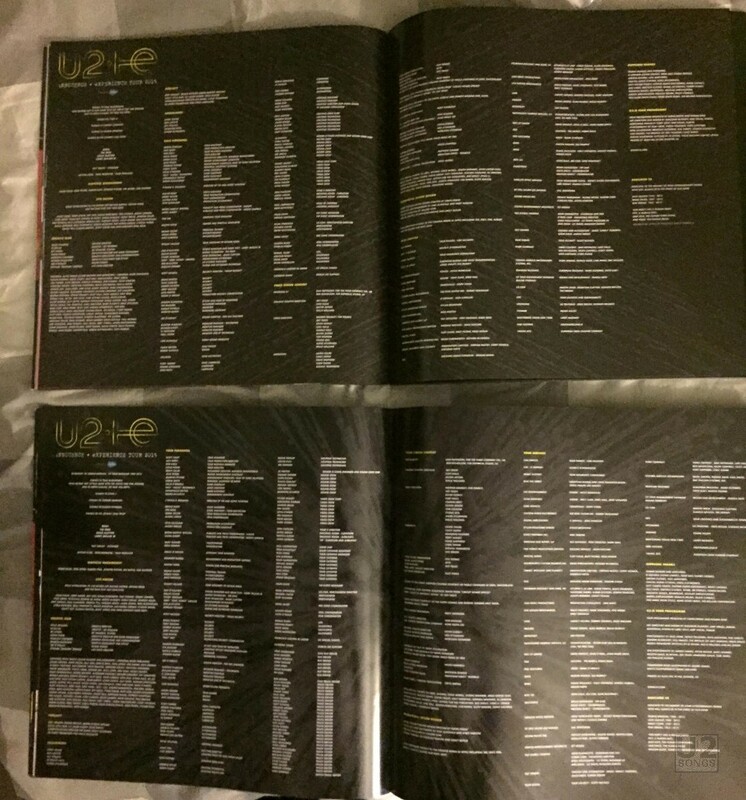 Sorry, we do not know which version of the tour book is currently selling on u2.com. If anyone has ordered one lately please let us know when it arrives. A huge thank you to Vid, @mysteriousdays, for her help in obtaining the second tour book, and for Paul, for carrying the first one all over Vancouver.